Note: This 3,000 word story is a result of the question: Why doesn’t my math teacher have a teaching credential? After asking the question, I spent four months with another student journalist interviewing teachers and district employees, researching other schools’ teacher compensation and gaining a basic understanding of district-provided health care benefits. Note: This story was not part of Kellen Browning’s winning portfolio for the 2016 National JOY competition. Last year, Angela Chu was a promising student-teacher in Davis High School’s math department, teaching three classes for James Johnson and Dan Gonzales. Johnson, head of the math department, thought the 29-year-old was a prime candidate for a full-time position. Chu is not alone in her decision — for years, the Davis school district has lagged behind other districts in salary offerings, which has contributed to a teacher shortage in Davis. DJUSD health care benefits, though top-notch, take a big bite out of monthly paychecks — another deterrent to teachers looking for higher pay. Under the Patient Protection and Affordable Care Act, health care plans are ranked as bronze, silver, gold and platinum based on annuity values. Additionally, Best said the Davis district offers $172 per month in “in lieu” payments: If a teacher does not take benefits from the district — for example, if a spouse’s job provides health care for the family — they receive money from the district. So what’s the catch? Coverage is expensive. “People can’t believe how much I have to pay for health insurance for my family,” said Johnson, who said his benefits cost more than 15 percent of his gross monthly income under his plan. That’s $12,710 per year for family coverage — a whopping 32.75 percent of the salary of a first-year DJUSD teacher with a bachelor’s degree ($38,811, as of July 1). The highest possible salary — a 25-year teacher with a master’s degree and 30 credits or a bachelor’s degree and 90 credits — is $86,253. Johnson recalled that several years ago, he tried to convince one of his teacher colleagues to move to Davis. She told him that day-care costs for her children would outpace her salary as a Davis teacher. According to the National Association of Child Care Resource & Referral Agencies, day care in the United States costs an average of $11,666 per year. For a rookie teacher with one or more young children, $38,811 per year would not be enough money to justify the move. Contrast the DJUSD starting salary with Elk Grove’s $43,546 for first-year teachers and $90,983 max — which takes only 19 years to reach — and it’s not hard to see why Chu and others have left the district, contributing to an ongoing teacher shortage. The shortage is not unique to Davis; Best said it began during the 2008 recession, when few teaching jobs existed and potential teachers chose not to enter the profession. Best said teacher credential programs saw enrollment plunge by 70 percent in five years. Additionally, teachers who would have retired during the recession held off as their salary shrunk, leading to a “big slew” of retirements in the improved economy, Best said. Davis’ fight for teachers was made more difficult in 2013, when California implemented a new policy called the Local Control Funding Formula, aimed at increasing aid to school districts with a high percentage of “unduplicated” students — English learners, foster youths and students on free or reduced-price lunch plans based on modest family incomes. This method of fund distribution gives districts with a high percentage of unduplicated students much-needed aid. But, according to the California Department of Education, districts like Woodland and Sacramento City have much higher percentages of unduplicated students (71.29 and 71.41 percent, respectively) than Davis (27.08). Because of its small percentage of these students, Davis receives less money from the state than it did before the LCFF was implemented. And some competitors, like St. Helena Unified in Napa County, are basic-aid districts, meaning their teacher salaries are buoyed by high property taxes. Making competition for teachers even more difficult for DJUSD employers are high Davis housing prices, which provide another incentive for teachers to move to nearby cities like Woodland or Sacramento. Because of these factors, it is difficult to compare DJUSD salaries with those of rivals like Elk Grove and Sacramento, which have far greater enrollments and percentages of unduplicated students. Best said the only regional competitor within 100 miles of DJUSD that is comparable in size and unduplicated students is Rocklin Unified (21.24 percent unduplicated). So how does DJUSD stack up against Rocklin? The starting salary for a Class I teacher (bachelor’s degree) in Rocklin is $45,253 — about $7,000 more than Davis pays. Best emphasized that DJUSD is doing everything it can to attract new teachers and negotiate increases to the salary schedules. “This fall we will be soliciting community member participation to assist in creating an action plan to implement a new part of our DJUSD strategic plan focused on recruiting, supporting, evaluating, retaining and advancing a team of talented and dedicated DJUSD professionals,” the superintendent added. According to Wendy Lewis, a human resources administrative assistant, the Davis district recently increased the number of years of experience that teachers can transfer from other districts when they start work in Davis from 10 to 20, enabling veteran teachers to avoid a huge salary drop when they come to DJUSD. And in 2014, the district and the Davis Teachers Association agreed on a 2-percent salary increase for each of the next two years, and added a 25th salary step for longtime teachers. But Best said other districts are taking similar measures. “(DJUSD salaries are) going to continue to drop proportionally because you’re seeing other districts around us doing 6- or 7-percent (increases) on the salary schedule deals whereas we’re doing 2,” he said. But Joe Nomellini, a former DHS counselor now working full-time at Modesto Junior College, said he loved his high school position; his departure ultimately came down to finances. “It was a brutal decision for me,” Nomellini said. “The annual salary, retirement opportunities and benefits package drove my decision. While I enjoy my work at Modesto Junior College, I miss DSHS and the students I served. Best and others have also cited the Davis environment as a draw to teachers seeking eager students and more leeway. “In Davis, we traditionally have less discipline and more freedom in the classroom and a variety of classes that are interesting to teachers,” Best said. Johnson noted, however, that a better teaching atmosphere doesn’t pay the bills. And Chu said her new school in Elk Grove is very similar to Davis … with a key distinction. “I found a school that’s similar to a Davis environment with parents that are really involved and the kids are really eager to learn and they want to do well — but with higher pay,” she said. In fact, Chu said, the Davis environment, with the academic pressure and the high expectations on which the community prides itself, actually was a deterrent for her. Whatever the reason, DJUSD struggles to attract teachers, which has created the current shortage. The shortage, in turn, affects day-to-day activities, especially in the math department. At first, Johnson thought the solution was to interview and hire teachers earlier in the year. In 2015, DJUSD started interviews for five math openings in March or April, and hired three teachers before the end of the 2014-15 school year. One left over the summer to take a Woodland job, so Davis hired two more right before the school year started. One of those new hires was Cal Poly San Luis Obispo graduate Derik Birdsall. The math major was hired at the last minute in July 2015 despite lacking a teaching credential. Birdsall, who has a master’s degree, taught five classes during the 2015-16 school year. But that isn’t enough money to support his wife and newborn son, so he also teaches night classes at American River College. He attributes the shortage of math teachers to the wide range of opportunities available to college graduates with math degrees. “If you have a degree in science or mathematics, you can find a job in industry that pays a much better salary for what is often considered better working conditions,” Birdsall said. To cover the one vacancy, five teachers had to teach 120 percent, or six classes, in the 2015-16 school year. In 2014-15, eight teachers had to add a class to their workload. Johnson thinks that potential math teachers, who have better-paying career options, would need to be paid some sort of bonus to be attracted to the profession. The DHS counseling department is also affected by the shortage. Although head counselor Courtenay Tessler said the department has not experienced too much turnover, counselors like Nomellini do leave from time to time for better-paying locations, and the department is currently overworked and understaffed. DHS currently has five full-time counselors and one who works part-time, and has felt the impact. Tessler thinks the district has strayed somewhat from “your foundation and your basics” — which she believes is having enough vice principals and counselors — in its attempt to address issues like the achievement gap. Tessler suggested the district could downsize slightly by removing some classes, like ornamental horticulture and LEAD, a leadership class, with low enrollment (the two classes had nine and 10 students, respectively, in 2015-16). “If classes are low-enrolled — if there’s only eight or nine kids that are signed up for them — then we shouldn’t offer them,” she said. So how do teachers and counselors voice their opinions? The Davis Teachers Association and DJUSD negotiate compensation through a process called interest-based bargaining. Best explained the reasoning behind the yearlong process. Last year’s DTA president, Frank Thomsen, has been on the teacher side of negotiations in the past and is a strong advocate for increased teacher pay. One possible way of increasing teacher pay is Davis’ parcel tax, which accounts for 12 percent (roughly $9.5 million) of DJUSD’s annual budget, according to the district’s parcel tax oversight committee. Most of that money is allocated to district personnel and teachers. But because DJUSD receives less funding under the state formula due to its low percentage of unduplicated students, the district remains only averagely funded even with the parcel tax. In the spring, school board members were considering an increase to the tax, which would have added millions of dollars to the district budget and potentially benefited teachers. But they concluded that a higher tax could fail to achieve the two-thirds majority required to pass in November. So the board settled on a $620-per-parcel tax that maintains the current level of funding, with an eight-year duration. Although he hopes for further salary increases, Thomsen said he is concerned about basing teacher salaries on a funding source that can expire. Thomsen said the Davis district tends to budget conservatively, and often ends up with about $1 million left over. Best said the positive variance is generally about $500,000. Although the favorability is not an ongoing sum of money and therefore cannot be added to yearly salaries directly, Thomsen believes there should be a way to get it to the teachers. “At some point, if that money didn’t get spent … then by all means that ought to go to the general fund, of which teachers alone make up about 60 percent,” Thomsen said. He likened the situation to people who paid too much in taxes getting a refund from the government. Thomsen recalled a year when teachers took a 2.7-percent pay cut (about $700,000 total), and the favorability for the year was about $700,000. The following correction was published Wednesday, Aug. 31: Last Wednesday’s story about Davis teacher salaries included some incorrect information about Double Decker Day School. The monthly tuition quoted for the preschool was erroneously inflated, and the day school closed about 18 months ago. A child-care program continues there. We regret the errors. Note: Two years after Proposition 47 passed, the effects on Davis became tangible. 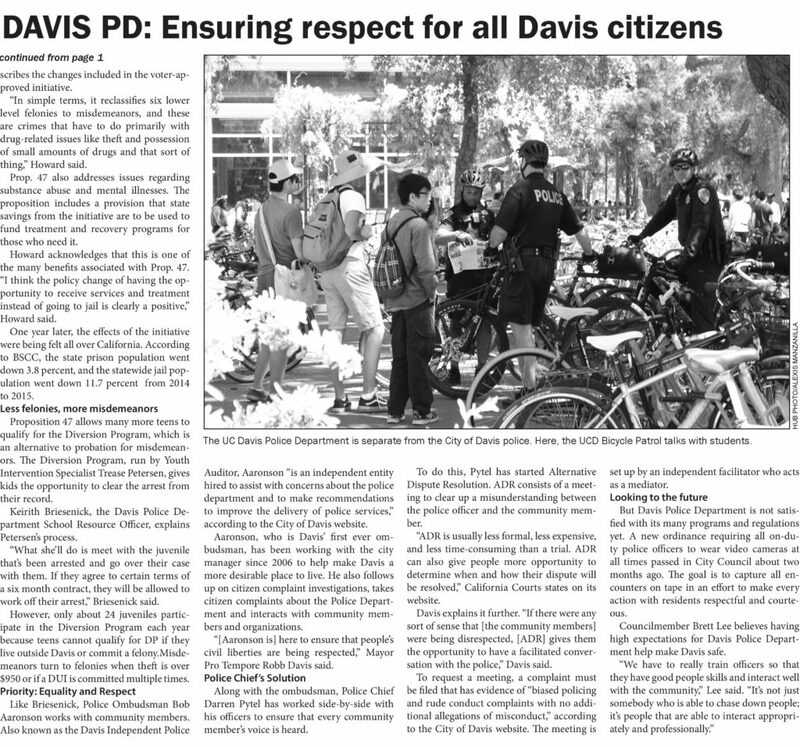 I sought verification from the Davis Police Department that the number of arrests of minors had decreased and interviewed credible sources in our community — the Davis Police Department School Resource Officer and Davis Councilmember Brett Lee. Note: Davisites have been visiting this park for 20+ years. As a result, when it temporarily closed, people had questions galore. I familiarized myself with the park’s history before interviewing a representative from the city manager’s office, so I could ask more in-depth questions about the rebuilding process. Rainbow City, the beloved Community Park play structure that closed in November 2014 due to an arsenic leach from the pressured wood, is in the process of being fully renovated and is scheduled to reopen for public use in early September. The first step — removing all the contaminated soil and disposing of it — was completed in May, clearing way for the start of construction on July 13. Leathers & Associates, which built the original Rainbow City in 1991 with an army of local volunteers, will work alongside other site contractors to recreate the park over three weeks, keeping as many of the original concepts as possible. The company “took information gathered from previous community meetings, drawings created by children in various summer camp programs, and feedback provided at the Community Design Day held on April 2, 2016, and used that to create the updated structure,” according to the city’s website. Members of the Rainbow City Advisory Group also provided input on what they liked and disliked about the old structure. Carrie Dyer from the Davis city manager’s office described the most requested components of the new park. However, a few changes were necessary due to new laws and regulations. There will be two entrances: the already existing entrance and another located off the parking lot. In addition, the tot lot will be separated from the main play structure. The swings are being moved across the playground to allow for the growing space needed between the swings and fence. And perhaps the most notable feature of the playground — the wood — is no longer ideal. Charlie Russell, a participant on Rainbow City Advisory Group, explained why. Furthermore, wood requires much more maintenance to meet the current standards of the U.S. Consumer Product Safety Commission and the American Society for Testing and Materials. So what will the new structure look like? “Much of the structure will be a dark wood color with dark green slides and a few dark green enhancements,” according to the city’s website. Rainbow City will remain the same size in square footage while adding a couple of inches to the tallest point on the playground. And yes, the original tile wall will continue to occupy its sacred place. The hand rainbow sign and plaques are also being saved for the new structure. Russell advocated for both of those, remembering the original four-day community build. “I helped dig post holes, and my wife and kids were sanding and nailing. It’s just a big community effort to put it together,” Russell said. However, this renovation will be mainly contractor-built, with the exception of a few volunteer days in late July. “They’ve requested 18 and older to help out. So, I’ll be getting some information out to the (Rotary clubs),” Dyer said. Russell said that if it weren’t for the dedication of Dyer and other city staff, the project wouldn’t have happened. Dyer has one end goal: to bring something back that people can enjoy for a long time. “It’s been sad for people. So we’re really excited to get it back open and do a big ribbon-cutting type of ceremony,” the mother of two said. 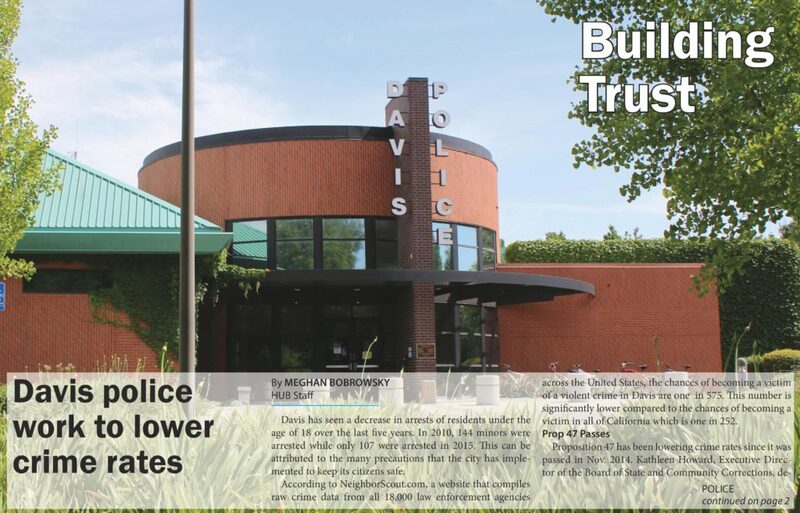 For more information on the rebuild, visit www.cityofdavis.org. Note: This story similarly started with a question: How does autism affect students at my school? I attended a school event promoting autism awareness where I chatted with an autistic student and his inclusion leader. I also used statistics from the Center for Disease Control to strengthen my article. Google defines autism as “a mental condition, present from early childhood, characterized by difficulty in communicating and forming relationships with other people.” The behavioral disorder, also known as Autism Spectrum Disorder, is different for every affected person, and therefore difficult to define in great detail. Because of the range of severity, people worldwide lack a clear understanding of the developmental disorder. As a result, April has become Autism Awareness Month, and in 2007, the United Nations proclaimed April 2 World Autism Awareness Day. WAAD was celebrated at Davis High on Friday with a puzzle piece coloring activity in the quad during lunchtime. Students gathered to create their own puzzle piece and tape it to a poster board with other pieces. The posters will be hung in the hallways early next week. DHS inclusion leader Leti Vasquez works with a variety of students and helped run the event. “I’m hoping to at least share with students as they come and make puzzle pieces that the puzzle symbolizes that autism is really puzzling. And when people say, ‘What is autism?’ you really can’t answer it because it’s so different for every student that has it,” Vasquez said. Autism Speaks, an autism advocacy organization based in New York, has been encouraging people worldwide to “shine a light on autism” by dressing in all blue on the designated day since 2005. According to the organization’s website, countries throughout Europe, Asia and South America have shown their support by lighting up famous landmarks, such as the Israeli Parliament Building in Jerusalem, the Panama Canal and the Great Buddha of Hyogo in Kobe, Japan. 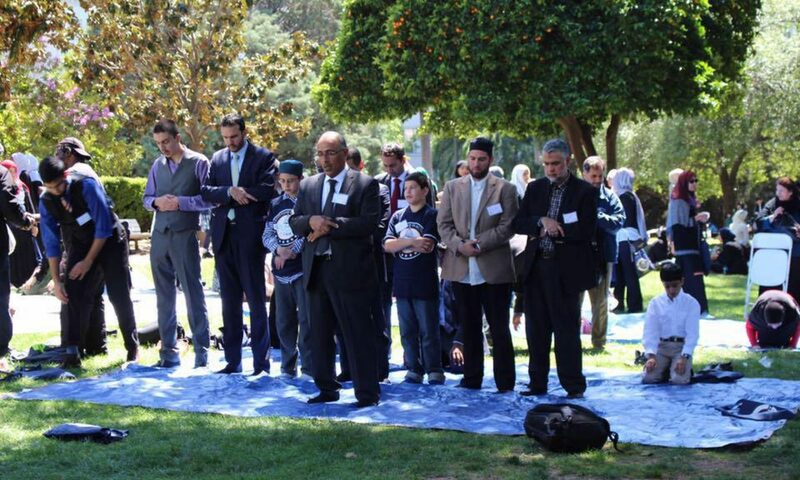 President Barack Obama recognized WAAD this year and shared his aspirations for the future. “Today, and every day, let us reach for a future in which no person living on the autism spectrum is limited by anything but the size of their dreams‑‑one in which all people have the opportunity to live a life filled with a sense of identity, purpose and self-determination,” Obama said in a White House press release. According to the Centers for Disease Control and Prevention, approximately one in every 68 American children has been identified with some form of ASD; an estimated two million individuals are affected by ASD in the United States alone. Sophomore Steven Derby puts a face to those statistics. Derby understands it’s not always easy to interact with kids with disabilities, but he wants to spread a message. “For all you people out there, give people with mental disabilities a chance. Give them hope. Give them something for them to look after and reach out for,” Derby said. Senior Sadie Brown followed Derby’s advice and found herself with many new friends. “[Teenagers with autism] have lots of different things to say, and they think many different things that are interesting that you wouldn’t think of or expect,” Brown said. And while ASD isn’t fatal, there is no “cure.” According to NIMH, there are no known causes of ASD. However, research hints that genes and environment are important factors. NIMH also says children with older parents–mothers over 35 and fathers over 40–are more susceptible to ASD. Irva Hertz-Picciotto, a professor at the UC Davis MIND Institute, is the director of the Program on Environmental Epidemiology of Autism and Neurodevelopment. To learn more about the causes and effects of autism, visit AutismSpeaks.org. Note: After the beat writer for construction graduated, I made it my duty to cover the construction of our new multipurpose room in different ways to keep students interested and updated. I wrote this article, which incorporates student opinions and details the progress. It was shared at a monthly stakeholder meeting. Following the groundbreaking of the new All Student Center on Oct. 25, Roebbelen Construction has been hard at work, pushing through the long hours before, during and after the school day. The team has already gone through the abatement process of demolishing the existing building and excavated the building pad. Currently, the construction team is building footings and setting rebar, which are steel reinforcing rods. The group is keeping to schedule, and the project will likely finish by December 2017, said George Parker, Director of Facilities, Maintenance and Operations, during a monthly stakeholder briefing in the Davis High library on Dec. 21. At the meeting, which DHS students were encouraged to attend, Project Superintendent Greg Brazell explained the significance and process behind excavating the building pad. “Before we can dig any footings and set any rebar, we have to actually make sure we have stable ground to build the actual building on. We take [the soil] down to a certain level. We have a soils engineer that’s out there on sight. He’s taking samples, testing the ground,” Brazell said. Once approved, the soil is compacted again and built back up to its original level, Brazell said. The next step is to start pouring foundation after everything has been inspected. However, none of those steps can be completed if the weather does not cooperate. Rain can cause months of work to unravel if the pad is not covered up during the downpour. Regardless of the weather, student involvement in the next couple months is going to be a big part, said Steven Pritchard, LEED Green Associate Senior Project Manager. Some summer internships will pay $19-21 an hour. The internships encompass a range of interests such as electrician and project manager, and are available to all Davis schools including King High and the Davis Adult School. Brazell wants students to be aware of the process every step of the way; this includes monthly or every other monthly walkthroughs of the progress. In addition, the senior class of 2018 will sign the final beam before it is placed in position, Parker said. Parker also brought up the prospect of a time capsule and a big vinyl wall to show accomplishments of past alumni. These ideas sparked interest in juniors Stephen Nichols and Max Muller who were initially drawn to the meeting by the free pizza. Muller likes the idea of promoting past and current student achievements as well. “I like how that might promote students to do more for the community and try harder to make something happen because it’s like ‘Hey, I get an accolade for achievements that will live on for who knows how many years,’ ” Muller said. Brazell acknowledges excited students like Nichols and Muller and urges them to take part in the journey. “Normally when we build schools and do things, students aren’t there. We don’t let them get involved for safety reasons. But this one’s being offered. Take advantage of it. Get involved. Jump in,” Brazell said.